Thanks to Mimi Clark of Veg Gourmet for sharing this super yummy quinoa recipe using Alter Eco fair trade quinoa! Mimi has been a vegan cooking instructor and natural foods consultant in the Metropolitan Washington, D.C. area for the past 20 years. 1. Rinse quinoas individually in fine mesh strainer. 2. Place quinoas in separate pots, add broth to each, cover and bring to boil. 3. Reduce heat and cook quinoas for 15 minutes until liquid is absorbed. 4. Turn off heat and let quinoas fluff for 10 minutes. Set aside to cool. 5. Combine pesto ingredients in food processor or blender and process until smooth. 6. Taste and adjust seasonings, adding more non-dairy milk if necessary. 1. Lightly spray 4, 1-cup ramekins. Fill each ramekin with 1/2 cup white and 1/2 cup black quinoa in any design, packing down to insure easy release. 2. Place serving plate over one timbale and quickly flip it over onto the plate. Repeat with remaining quinoa. 3. With lightly damp fingers, adhere 4 nori strips, cut to size, shiny side out, to the exterior of the quinoa. Dollop pesto next to each timbale. 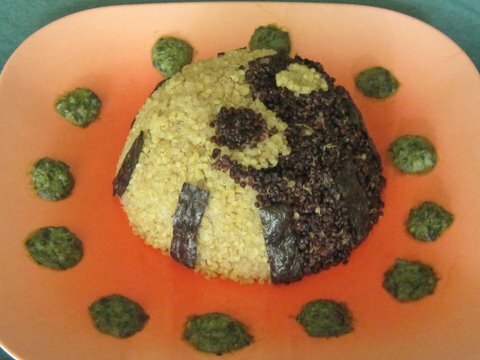 Let us know what you think of this easy vegan recipe: Black & White Quinoa Timbale with Wasabi Pesto and Nori Strips! What a stunning dish! I started eating quinoa recently and this is on my “to cook” list. I’ll bet this is just as good as Mimi’s other dishes I’ve tried in her monthly vegan cooking classes. Way to go Mimi! I have become a big fan of Quinoa as a result of Mimi Clark’s wisdom about protein alternatives. I don’t do well with soy, but quinoa is such a great way to get what I need, and Mimi can suggest a way to make anything taste terrific. Thanks for posting this recipe. I really appreciate it. Beautiful presentation! If you do not know Mimi, visit her website and be amazed! I’ve been a blessed recipient for years of Mimi’s vast wealth of nutritional wisdom and her delicious, creative recipes. She has catered many affairs and everyone always raves and enjoys her healthy dishes. This one looks amazing and I will definitely try it! This recipe looks delicious! I am a huge fan of Mimi Clark and her AMAZING recipes! I can’t wait to try this and pass it on to all of my friends. Mrs. Clark is a phenomenal chef! She not only shares great culinary knowledge, but also shares a lot of great information about vegan food and the benefits of a vegan diet. This recipe will definitely hit the spot! I’ve been a fan of Mimi Clark’s recipes for years. This one sounds just yummy, and as I’m very fond of quinoa, I will certainly be trying this one!